The perfect-sized cucumbers for making home-canned pickles. There are several bush-types available for those with limited space. Bush cucumbers can be grown in containers on the patio, deck, or a sunny balcony so that even those with no space can still enjoy garden-fresh vegetables. Harvest the cucumbers as soon as they reach their mature size. 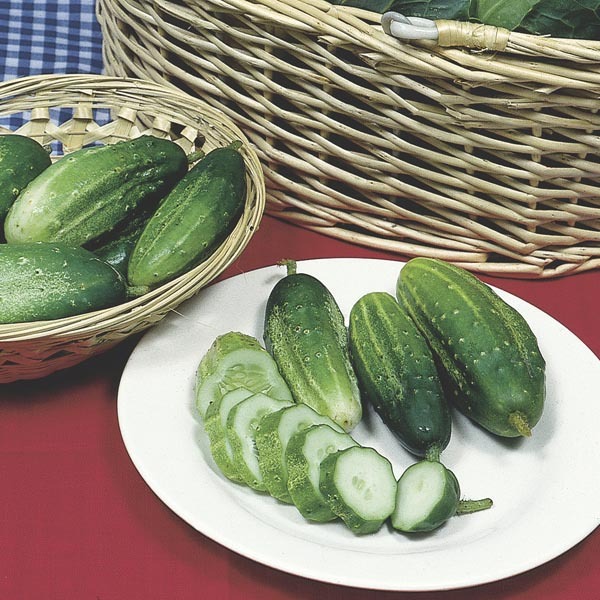 If allowed to grow beyond the ideal size the cucumbers can turn soft and bitter. Eat fresh for a delicious and nutritious snack. Slice into salads, layer on sandwiches or toss with vinegar, onion and seasoning. Serve with dip on a vegetable tray. Wash fruits, vegetables and herbs thoroughly before eating.